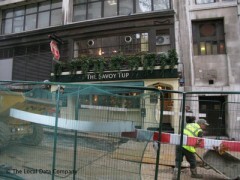 About: Savoy Tup is a rather unusual pub. Guests are invited to bring in their own dishes to enjoy whilst sipping on a little something from their vast choice of beers, wines, spirits and cocktails. Catering for private parties of up to 50 guests is available upon request and seating on the pavement is provided, weather permitting.